So before upgrading, I was using Numix/Arc GTK themes on Xubuntu 15.10, and they worked pretty well. I changed the widget/primary color to a light green using the Theme Configuration utility (see the picture below). After updating to 16.04, however, it seems that most widgets have defaulted to their original colors (blue in the picture attached). Also, when hovering over items in context menus, they have blue backgrounds. Buttons, loading bars, combo boxes, etc. all have the default blue color now. 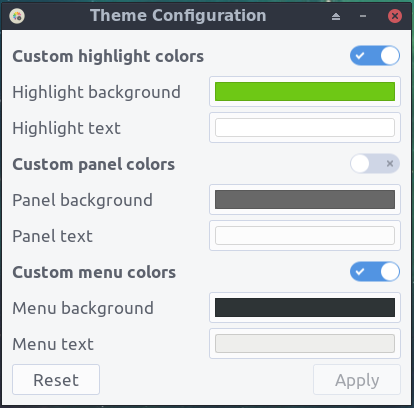 Some things do have the light green background; the items in the Application Menu (when hovered over), the program currently in focus on the top xfce panel, and even Mousepad (the text editor) has green hover backgrounds in the context menu. This is not a problem with one theme. This happens with Numix, Arc, the default themes, etc. Kinda stumped on this issue. I know it's minor but I just want things to look uniform to a degree :) Also sorry if this is the wrong place to ask such a question, wasn't sure where to go! Browse other questions tagged 16.04 xubuntu themes colors or ask your own question. How do I fix the menu items background color in MediterraneanNight theme?